The latest trailer introduces four playable characters, which includes Laxia, Sahad, Hummel, and Ricotta. Check it out below. Lastly, Ys VIII: Lacrimosa of DANA Day One Edition for the PlayStation 4 announced. 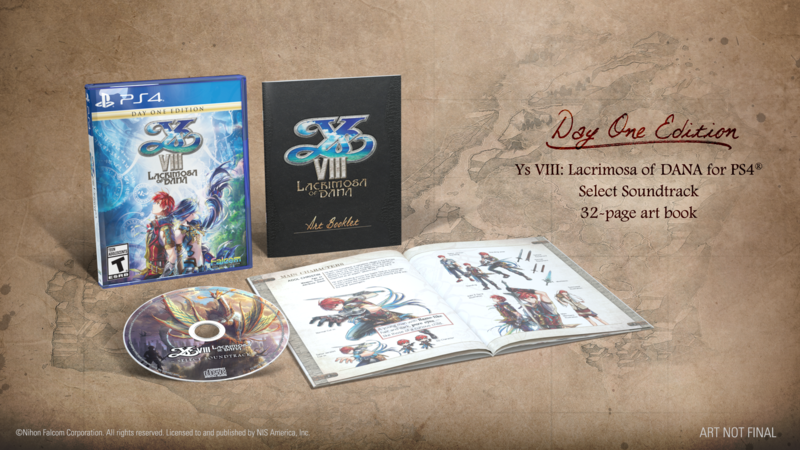 The PS4 Day One Edition and the standard edition PS Vita copies of Ys VIII: Lacrimosa of DANA include the reversible cover voted by fans! Preorders are available on GameStop for the PS4 and PS Vita, Amazon for the PS4 and PS Vita, or Best Buy for the PS4 and PS Vita. Ys VIII: Lacrimosa of DANA releases in North America on September 12, 2017 and in Europe on September 15, 2017.